Want to get the rundown on every aspect of your system hardware? Speccy (free public beta) gives so much detailed, technical information about hardware, it could choke even the mind of a hard-core techie. 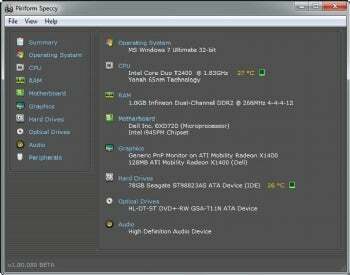 Speccy provides an incredible amount of detailed data about your PC's hardware. Run Speccy, and its summary screen gives the basics, including your CPU type and specs, motherboard information, graphics care data, hard drive information, and information about your optical drives and audio. When I say "basics," though, I mean basics according to this program, which means more detail than most other programs give. For example, it shows you the temperature of your CPU and hard drive. Click any category of hardware, and Speccy gives you a remarkable amount of technical detail. For your CPU, for example, it lists each individual core if you've got a multi-core CPU, and provide detail about each core, such as its speed, temperature, and so on. It also offers similarly detailed information about the entire CPU. Speccy is more comprehensive than other system analysis programs, such as SystemInfo. If you only need basic system information, you don't need Speccy. But if you need detailed technical data about your hardware--or just like knowing that sort of thing--it's a great program to download. Note: Speccy is still in beta, and developer Piriform (best known for CCleaner) recommends that it only be used by advanced users on test machines.